What I perceive, is what I believe. What I believe, is what I know to be true. When there are not finite answers to support or contradict my perception and experience, I begin to question. When I am on uncharted ground, and there is no one to give me answers, I am forced to go inside and ask and answer my own questions. I also go directly to my nonverbal friends, I partner with. It is ironic because there is nothing, I have questioned more, than the process of partnered communication. I hypothesize "guess" partnered communication strategies such as FC- Facilitated Communication, RPM-Rapid Prompting Method, or what I like to refer to as ECC - Energetically Connected Communication, have the potential to dramatically change the way consciousness is viewed. FC is a process, where the facilitator provides hand, wrist or arm support to address movement difficulties. RPM, by contrast, is a process that involves a partner. He or she either holds the keyboard or sits in close proximity. Both strategies require joint attention, focus on the keyboard and a need for material to be typed. ECC looks like FC when arm support is given or RPM if I hold the keyboard or sit in close proximity. However, it differs in definition. I recognize it as an energetic partnership. Some people, including myself attempt to join consciousness individually and collectively with these intriguing souls. Most, but not all people using FC, RPM or ECC, have a primary diagnosis of severe autism. Although most are nonverbal, others have have limited speech. By limited, I mean nonsensical, echolalia, or some words used to request basic wants and needs. They are not conversational. But, when paired with a partner, for some amazing, unexplained, unstudied, reason, these same individuals flourish. New stories continue to come forth from parents shocked by the extreme intelligence, suddenly displayed by their children, once they are introduced to partnered communication strategies using FC or RPM. Some proponents of these strategies state the child's body does not cooperate with his mind. In some cases, this is true. Other times, eye hand coordination is very good, but there still seems to be disorganization or uncontrolled movements at the thought level. I suspect this disorganization is dissimilar from individuals unable to speak or type due to motor issues like those seen in cerebral palsy. There is so much not known or understood. Some people who endorse theses processes believe or state, every answer the child gives has been learned through direct instruction. Some speculate the child picked up information from the environs. Some speculate the kids are in touch with spirit and universal field of thought and come in educated. There is only speculation as nothing is really known for sure. Historically, partnered communication, when defined as solely the perspective of the person typing, devoid of any outside influence or bias, has proven to be dangerous. For this reason, I always share authorship and responsibility. Until more is known, I suggest others do the same. Detractors deny the effectiveness of the process, altogether. They feel parents and therapists are deluding themselves and information is coming from the partner, knowingly, or unknowingly. I suspect there are elements of truth to varying degrees in all these scenarios. The "WHY" or to what extent is ignored. Deep investigation has not been done. Since I personally suspect there is a spiritual or quantum aspect to the phenomenon, I will use one of my favorite made up terms "Qautist" to define these unconventional, elusive, communicators. I define "Qautist" as anyone with very limited spontaneous, independent, functional language, whether spoken, written, typed, or signed, who when paired with a partner, suddenly demonstrates previously unrecognized intelligence and literacy skills. Knowledge expressed is way beyond what was thought possible. WHY do I need to know the question being asked? WHY can't the Qautists bring through information, I am not privy too? (e.g. the name of a grandmother not know to me as their partner) WHY do I often hear the word or words before the Qautists type them? Is it possible, I inadvertently lead them or do they lead me? WHY do the Qautists type with different styles, interests, and levels of awareness dependent on who serves as their partner. 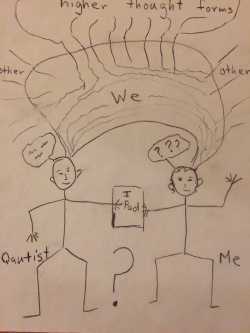 WHY do Qautists give contrasting information when paired with several different partners? WHY do Qautists seem to know everything I know, or everyone, whether they are in their physical body or in spirit realm? WHY must I look at the keyboard when Qautists type? WHY must I hold joint attention to keep the flow of information going, even more so when I do not give arm support? WHY is the Qautist restricted by the language I speak or my level of knowledge and vocabulary? Most perplexing, WHY aren't other partners asking these questions? WHY aren't partners coming together to form hypotheses to investigate this intriguing process? WHY aren't experts in the field of consciousness curious enough to coming on board? In spite of all these unanswered questions, I continue to use and evolve with this fascinating tool to bring through what I suspect are higher thought forms. These shared communications seem to broaden my awareness, and have a calming effect on the Qautists. Messages received during partnered communication are often inspiring, and thought provoking. I am constantly humbled, moved, intrigued, and enlightened. I enjoy the process. I sense, perhaps, I serve as their bridge to linear world as they open me to the unseen or quantum realms. My Quatist friends seem to enjoy the process as much as I do. The process appears to create balance, understanding, a deep level of friendship, and mutual respect. What boggles my mind is WHY others aren't interested in understanding the enigma? 1. I suspect during partnered typing activities, the Qautist and his partner's brain waves synchronize and match each other in phase and amplitude. One person waves may be stronger and entraining the other. I suggest brain imaging equipment might show what areas of the brain are being activated? Who is initiating first? Under what circumstances does partner initiation flip? 2. I suspect the Qautist and his partner may also align bodily rhythms-heart rate, breathing. Could this be measured? 5. I suspect the nonverbal person higher mind/subconscious merges with the higher mind of his partners. It feels like communication is a single unit or emergent voice. I further question, whether the Qautist opens the higher mind of their partners and helps them to connect to the universal flow of information, directly. 6. I suspect, though the process appears to have telepathic like component, it will never meet criteria for typical telepathy, or image sending. It is more like a shared consciousness, I even suspect more energies are at play than the two participants. 7. I suspect the Qautist often aligns with the interests of his partners and helps him expand on his current knowledge. 8. I suspect, in terms of expressed knowledge, it is the Qautist's partner who is the limiting factor, not the Qautist. As partners grow in trust, remove biases, and get ego out of the way, I suspect the Qautist can bring knowledge through with increased fluidity and accuracy. 9. I suspect the Qautist is extremely aware of very subtle cues-Clever Hans Syndrome. (e.g slight movement of a key board, or letter board, eye gaze, and sub-vocalizations.) It is fascinating how astute they are in compared to verbal autistic or typical peers. 10. I suspect the process has similarities to channelling and inspired writing. During conscious channelled and inspired writing, spirit is coming through a person, who is often the limiting factor. In partnered typing, I suspect the Qautist's partner may be the limiting factor, affecting the purity of the change. The material received should be subject to the same discretion by the reader. Accept only what resonates with you. I have many more questions and speculations, but this is a start. After, all these years, some days, I have absolute faith, and other days, I am befuddled! I continue to report what Qautists ask me to share. At the same time, because of my unanswered questions, I share authorship and responsibility. Even though my friends tell me I am am doing a great job of staying out of the way, I still question the purity of my channel or anyone elses who serves as a partner. I suspect it varies. Partners need to understand the importance and responsibility of their role. Best advice, I would have for partners, would be to hold the intention of being of the highest service to the Qautists. Listen and report without judgement. Stop as soon as the flow does. Whether you choose to use partnered typing or not, I suggest parents see their child as a whole person, body, mind, and spirit. Accept them for who they are. Help them feel comfortable in their body and their surroundings. Help them with movement and sensory issues. Teach independence. Give them multiple opportunities to make independent choices, Use independent communication systems in addition to partnered strategies. Love, accept, and empower your child! If anyone else is interested in trying to figure out why and how the partnered typing process works, please comment or message me. a “Think Tank” composed of proponents and detractors, and access to brain imaging equipment might finally shed some light on this puzzling phenomenon.